Adventure Time is such an imaginative and surreal show that you could pretty much make any kind of game based on it that you'd like. So ... how about Gauntlet? And why not make it an homage to NES gaming while you're at it? Not the first thing that came to mind? Well, that's the approach taken by Adventure Time Explore the Dungeon Because I DON'T KNOW! and unfortunately it captures all of the worst parts of that quarter-muncher from the 80s while failing to capture the fun of the show. The setup for the game is that something untoward is going on in Princess Bubblegum's dungeon and she wants you to go down there and see what's going on. Why? Because I DON'T KNOW! It's right there in the title. Anyway, pick your favorite character from Jake the dog, Finn the human, Marceline the vampire, or Cinnamon Bun the cinnamon bun and head down the steps into the dungeon. Sorry, if you were hoping to explore the Land of Ooo, you'll have to settle for a small plaza in the Candy Kingdom and Princess Bubblegum's 100 level, randomly generated dungeon. The dungeons are mazes that you view from the top down as you traverse them, with a random network of walls and the occasional pit defining the halls and rooms. Pieces of treasure and secondary weapons can be found lying on the floor for the taking. Piles of bones serve as monster generators, periodically shaking to life and spawning a monster at a rather leisurely pace. Your goal is to find the steps down to the next level without those monsters killing you. Pretty basic arcade dungeon stuff. 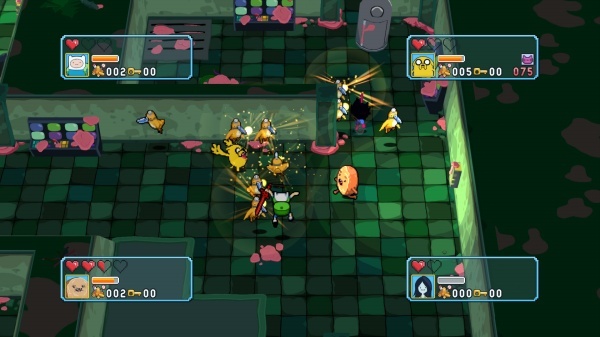 Each character has a basic melee attack which involves standing next to the monster and pushing a button a couple of times. Kill enough monsters this way and you'll power a unique "imagination" attack, which depending on your character either wipes out all of the enemies on the screen or spawns a secondary weapon or some food for health replenishment. The secondary weapons are imaginative as well - including such things as a gun that shoots kittens and a whip made of ice cream scoops - but they're all underpowered and you'll find yourself just sticking to the basic melee hack. While the game may have looked to Gauntlet for inspiration, it fails to mimic the right parts of that game. The randomly generated dungeons have no character - although it's been years since I've played Gauntlet I can still remember the layouts of some of its more infamous levels. The enemies in Explore the Dungeon are all rather tepid and attack in such small numbers that they're rarely a threat. The dungeons quickly become a grind, and you'll soon find that your primary goal on each level will be to find the exit as quickly as possible. It's not even really worth it to stop and pick up the treasures - the upgrades that they can be used on in the hub zone are priced too high and each time you go back into the dungeon all of your remaining treasure is taken from you because of a "candy tax". Every ten levels you'll encounter a boss fight. These fights are more imaginative than the dungeon levels and present you with the cutscenes that serve to move the story along after you win the battle. The story fits with the character of Adventure Time and features voice work by the show's actors, but, honestly, it's such a boring grind to get to these points that you'll rapidly lose the motivation to keep going. And the game sets its checkpoints every five levels, so if you don't want to lose your progress you need to play your way through to the end of the set of five and, if you should die you'll have to start those five levels all over again. It's hard to imagine that most players will have the patience to play through all 100 dungeon levels in the game. The gameplay is just too underwhelming and repetitive to hold your interest for long. 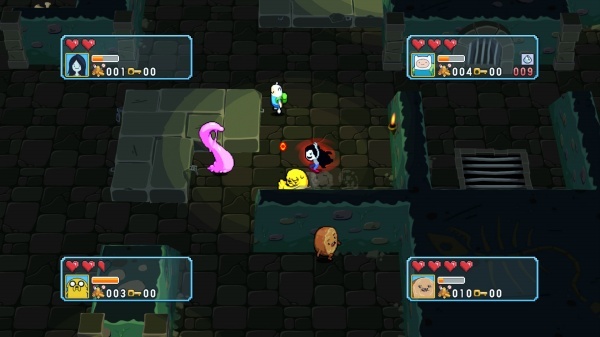 This Adventure Time game manages to be what the show is decidedly not: boring. Final Rating: 50%. You'll have to use the power of imagination to make it seem that this game is fun to play.